The elusive "great game" is our quarry and this is where we hunt! I recently had lunch with one of my players and we discussed the current state of our game (and he very kindly commented that I’ve been ignoring this site). Beyond the general consensus that people are having a good time and seem to be looking forward to each upcoming game session, the idea of momentum was briefly touched on. It got me to thinking. I’m currently running a lightly modified version of the 4E Tomb of Horrors. As a module, it plays quite a bit differently from what we’ve been doing. Over the past year or so of play, we’ve been very story focused. The mainline plot has gotten a lot of attention and has developed from a nascent threat against a few small villages into a full fledged regional destabilization. The group just reached level 11 and so far the threats they’ve faced feel about right to me. However, in The Tomb of Horrors, things are different. It’s not nearly as story driven. It’s really more of a set piece than a story, although there is some narrative behind it obviously. There is a reason for its existence and the powers behind it do create a sense of mystery (and a pretty serious problem) that needs to be solved. Now, keep in mind, this is a D&D “super” adventure. That means it’s one of those big, hardbound books, chock full of traps, combat, enemies and more. It’s meant to be run over a long period of time and across many levels. It ranges from Level 10 all the way to Level 22. The way we’ve been playing, that will take at least a year. That brings me to my concern. How does one effectively maintain momentum for a singular storyline and plot for 11 levels of advancement, over a year of play and across close to 45 four+ hour sessions? While I’m excited to run such an epic arc, I’m honestly a little concerned about losing attention spans (including my own). I’ve not broken the entire thing down by session and have only quickly read the adventure. That being said, I’m not sure the break points are there in order to establish a sense of accomplishment (IMO players need to feel like they’ve achieved something nearly every session), while pushing the group ever forward. I’m thinking there may be some ennui that sets in after the first 20 or 30 rooms of puzzles and traps. 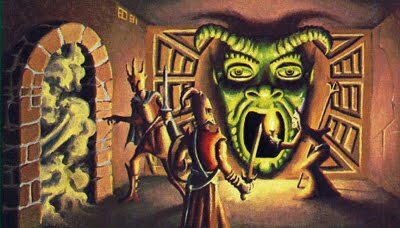 The original Tomb of Horrors was originally written as sort of tournament module for the very first Origins convention. Gygax wrote it personally to challenge the best players and to lay waste to those characters thought to be invincible. If you’ve ever played or read it, you’ll know that it could easily be resolved in a single sitting, frequently ending in a TPK. The modern 4E version is no such beast. It’s probably harder than most 4E modules (which is to say only somewhat easy) and has certain elements previously abandoned by 4E design. Those being: Points where progress halts without proper action by PLAYERS. Normal 4E design rarely requires the players to do anything, but rather requires skills from the characters and character sheets. However, in Tomb of Horrors there are places where advancement is impossible if players can’t figure something out. As the DM, you could easily hand wave these events, allowing progress based on appropriate skill checks, but in doing so you’d be ruining the point of the adventure. That is to challenge not only the characters, but the players themselves. Few puzzles in the game require skill checks (though many are made easier by them). Few can be solved purely by proper application of damage. In fact, some puzzles will be exacerbated by using standard 4E DPS techniques. This is truly an adventure written with the classical mindset of problem solving. But amazingly, it was written to be played over the course of dozens of sessions. So I have to figure out a way to maintain momentum over the next year. My players are very encouraging so I’m happy to try to make it work. But I have to think people will be bored of a singular storyline over such an extended time period. Which brings me back to my lunch meeting. In our discussion, we talked about side quests. In the past, I’ve presented quite a few to the group. On the rare occasion they would bite, but for the most part, they would smell any side quest and get the impression it was a diversion or a distraction from their main goal (sometimes they were and sometimes they were not). While I would normally commend such a strong focus, it can be a bit of a headache when you have some players looking to advance their characters storyline. I guess this leads me to my next question. How does one motivate the players to engage in expository side quests while not losing site of the larger goals and story arc? Being a person who likes to plan but doesn’t like to let those plans ruin a perfectly good game, I hope to find these answers as we go. It might sound like a copout, but I think the best bet will be to present side quests with a little more force, making them seem just as relevant as the main storyline, even tying them into the main storyline if it can be done without overburdening it. While also picking the appropriate time and place to insert them. I need to be aware of lulls in the action or narrative development and drop them like a hot potato. But it can be hard to time things right. When you’re in the middle of an organic and expansive experience, you often find yourself noticing the perfect time right after it has passed. And so I begin thinking about the next year. More than anything though, I need to stop and be thankful that I have a gaming group that I would even consider planning out that far. Most gaming groups I’ve been in have a shelf life of 3 weeks. Meaning, you can count on gaming for at least 3 more weeks at any given point. After that, you may or may not have a game going. I recognize that long stable campaigns can be the exception not the rule and I’m really happy to be part of that. Maintaining Momentum……for an entire year, or……4 years?